The smart grid is a way to better facilitate and manage all those flows and transactions into a cooperative, collaborative, transactive, reliable system. 2. 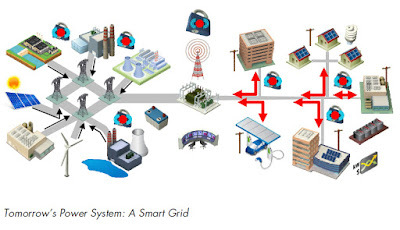 What is the Smart Grid? Energy is a global ~$6T market with historically little innovation. The energy industry is poised to change due to global warming and peak oil and this revolution will be facilitated by an explosion of information technology. Everything will be connected on the network and will be accessible by any device. What will this mean? A dictionary definition of the Smart Grid is a transformed electricity transmission and distribution network or "grid" that uses robust two-way communications, advanced sensors, and distributed computers to improve the efficiency, reliability and safety of power delivery and use. Integrate Intermittent Resources - As a matter of physics, the supply and demand of energy is balanced on a moment to moment basis. Renewable wind and solar energy resources are much more intermittent than the traditional coal base power plant. Parts of America’s existing dumb and fragmentary electricity grid are so vulnerable to load variations that their owners think they may be able to cope with no more than about 2% of intermittent wind power. Smart Grid technology can help manage intermittent sources and balance supply and demand. Manage Demand - Electricity demand varies widely over the year due to weather and use patterns. The capacity needed to supply the top few hours of peak summer use costs tens of billions of dollars. Smart Grid technology can help smooth the peak, increase load factors and the growth of peak demand. Engage Consumers - Today consumers have very little information about their energy use. It’s like going to the grocery store and getting a consolidated bill at the end of the month with very little information about the prices of the items you bought. Ubiquitous information to consumers reduces overall energy use, but more importantly, it reduces peak energy use by 5-20%, depending on pricing and market design and the availability of end-use enabling technology. Create Microgrids - The current grid can’t handle two way flows of electricity on the distribution network. A centralized grid can be inefficient and costly. Only a third of the fuel energy burnt in power plants ends up as electricity, with half lost as waste heat, and a further 8% lost along long-distance transmission lines. A more distributed grid, by its very architecture, can improve efficiency by matching local supply with demand. With multiple decentralized energy sources, electricity can be generated close to the point of use, avoiding the losses and congestion that result from long-distance transmission. The Smart Grid makes a more distributed grid possible by its very architecture, can improve efficiency by matching local supply with demand. With multiple decentralized energy sources, electricity can be generated close to the point of use, avoiding the losses and congestion that result from long-distance transmission. Enable Electric Vehicles At the moment, the grid would be unable to cope if a large number of commuters arriving home plugged in their electric vehicles more or less simultaneously to recharge them. Yet if those same cars were recharged at three o’clock in the morning, when demand is low, it would benefit both consumer (who would get cheap power) and producer (who would be able to sell otherwise wasted electricity). Such cars might even act as “micro-peakers” or regulatators, reservoirs of electrical energy that a power company could draw on if a car were not on the road. Managing plug-ins could be the smart grid’s killer application. Return on Investment - In April 2011, The Electric Power Research Institute (EPRI) released a broad assessment of the costs and benefits to modernize the U.S. electricity system and deploy what has become known as “the smart grid.” Factoring a wide range of new technologies, applications and consumer benefits the investment needed to implement a fully functional smart grid ranges from $338 billion to $476 billion and can result in benefits between $1.3 trillion and $2 trillion. This indicates an investment level of between $17 and $24 billion per year will be required over the next 20 years. The costs cover a wide variety of enhancements to bring the power delivery system to the performance levels required for a Smart Grid. 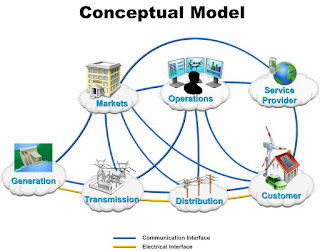 The costs include the infrastructure to integrate distributed energy resources (DER) and to achieve full customer connectivity, but exclude the cost of generation, the cost of transmission expansion to add renewables and to meet load growth, and a category of customer costs for smart-grid ready appliances and ;devices. The wide range in these estimates reflects the uncertainty the industry currently faces in estimating these costs and the possible reductions which may or may not occur over time. opportunities to bid for competing services. Energy Independence ;- The Smart Grid makes an electric vehicle economy possible. Without more intelligence, the grid will be unable to cope if a large number of commuters arriving home plugged in their electric vehicles more or less simultaneously to recharge them. Benefits included: reducing dependence on unstable oil supplying countries. Reduced balance of trade deficits. Reduces oil consumption by reducing the need for inefficient generation during peak usage periods. Reduced Greenhouse Gases by enabling electric vehicles and new power sources. The Smart Grid, combined with a portfolio of generation and end-use options, could reduce 2030 overall CO2 emissions from the electric sector by 58% relative to 2005 emissions (EPRI 1020389). A Smart Grid would be capable of providing a significant contribution to the national goals of energy and carbon savings. One EPRI report (EPRI 1016905) estimated the emissions reduction impact of a Smart Grid at 60 to 211 million metric tons of CO2 per year in 2030. More Consumer Choice - Making information available to everybody. More options for consumers. The smart grid consumer is informed, modifying the way they use and purchase electricity. They have choices, incentives, and disincentives. Managed Peak Demand - A more efficient grid, with reduced energy losses and a greater capacity to manage peak demand, lessening the need for new generation. accommodates all generation and storage options. Improved Power Quality - Improved power quality. EPRI studies have estimated the cost of power disturbances across all business sectors in the U.S. at between $15 billion to $24 billion due to power quality (PQ) phenomena (EPRI 1006274). Improved Power Reliability - Less outage time / shorter outages / smarter decisions. The Smart Grid independently identifies and reacts to system disturbances and performs mitigation efforts to correct them. Other EPRI studies have estimated the cost of power disturbances across all business sectors in the U.S. at between $104 billion and $164 billion a year as a result of outages (EPRI 1006274). The cost of a massive blackout is estimated to be about $10 billion per event as described in EPRI’s “Final Report on the August 14, 2003 Blackout in the United States and Canada.” Improved resilience to disruption. Capital Investment Savings - Optimized facility utilization and averts construction of back-up (peak load) power networks. Increased capacity and efficiency in operating existing electric power network. optimizes assets and operates efficiently. Risk Avoidance - Improved Cyber Security. 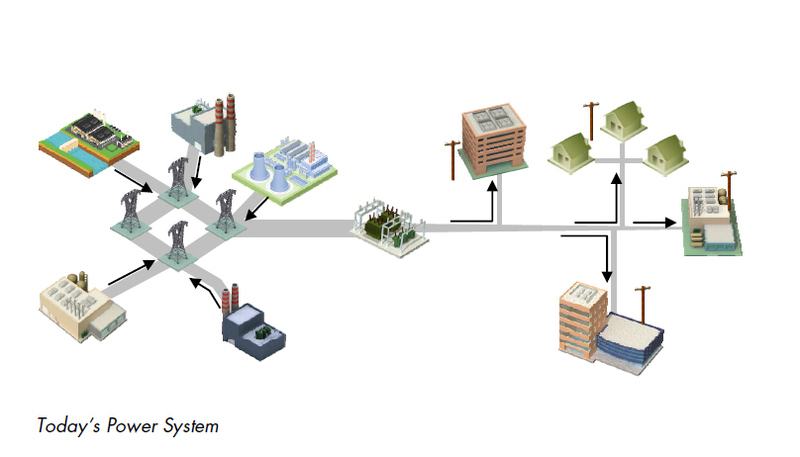 The Smart Grid resists attacks on both the physical infrastructure (substations, poles, transformers, etc.) and the cyber-structure (markets, systems, software, communications). Today most consumers pay the same rate for electricity regardless of when they use it regardless of the actual cost. The Smart Grid is not all about technology and consumers will not be engaged to change their energy use behavior without financial motivation. Without dynamic pricing, where retail electric rates reflect actual wholesale market conditions, smart grid technology will be ineffective. Lack of standards is a roadblock to deployment. In the absence of federal standards for the Smart Grid and smart appliances, any utility that dared to update its grid would have to gamble that its new features would remain compatible with next-generation technology. As Steve Hickok, deputy administrator of the Bonneville Power Administration, puts it, "No one wants to get stuck with a Betamax." How can we avoid incompatible systems being fielded that result in costly legacy systems that must be replaced much sooner than projected? Proprietary protocols and closed systems might stifle innovation. 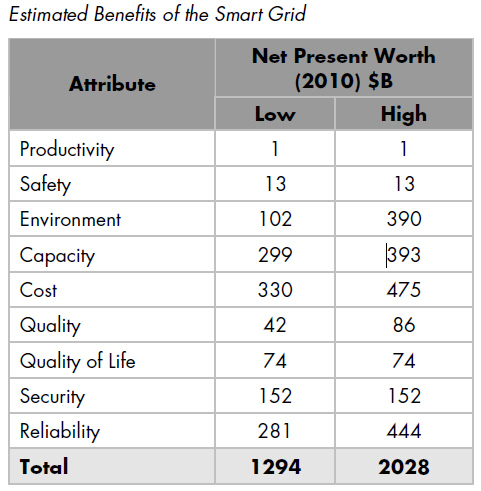 The Internet has two big advantages to offer the Smart Grid. First, it is layered, and so one can imagine layering the Smart Grid’s power plane under some new protocols. Second, the Internet is big and still rapidly growing. Some established Smart Grid players are making familiar sounds about the Internet not being right for energy -- too fragile, to insecure, etc -- and so they want to build a separate Smart Grid, instead of fixing the Internet. In January 2010, the California Public Utilities Commission (CPUC) soughtindustry input on its draft decision on adopting smart grid metrics. Number of and total nameplate capacity of customer-owned or operated, utility grid-connected distributed generation facilities. Avoided GHG emissions due to smart grid-enabled line loss reductions in the transmission and distribution system. This could possibly be done with a modeling tool. Avoided GHG emissions due to smart grid-enabled improvements in intermittent renewable integration that reduce the need for spinning reserves and other ancillary services. Number and percentage of customers whose data is compromised by a cyberattack, and number and percentage of customers notified of a data breach (DRA suggested). 8. Next Steps Computing and communication converged. What analogous convergence might we look for in energy? Some day the big box stores will stop slapping "smart" on appliances, since they will all be smart. Utilities will no longer install smart meters. Just meters. Studies will no longer appear measuring the size of the smart grid. Its intelligence no longer an oddity, we’ll drop the "smart" adjective. When the smart grid simply is the grid, then this industry will have arrived.